The days of searching for your desired locations by looking at impossible-sized maps or struggling to get info from non-English speakers are a thing of the past. Thanks to the ginormous number of traveling apps we have today, traveling has become much easier. From city maps, currency conversion, translation tools, and even weather apps, there’s plenty of ways you can make your traveling experience go with ease. Cittymapper is competing with Google and Apple maps in city navigating. Citymapper uses data from public transport authorities and provides information about public transport and cycling routes. It also offers info on the cheapest and fastest ways to get to places. To date, the Citymapper app offers information for 29 cities worldwide. For those nature-loving travelers, Google offers a large number of topographic maps perfect for those planning to go hiking, sailing or hunting. No need to worry about cell coverage; all the information from AlpineQuest GPS Hiking can be stored on your SD card for later use. Exploring the wild has never been made easier. Available for iOS and Android devices, TripCase lets you organize your travel plans in one streamlined itinerary. You can also get essential travel information with just one glance at your device thanks to this handy app. Organize your trip and keep up with the latest travel info regarding local events, restaurants and hotels with this app. 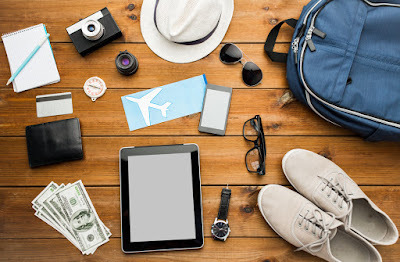 Thanks to TripCase your traveling experience will seem effortless. You can follow the path of a huge number of international flights on the zoomable maps offered by this fantastic app. FlightTack also provides info on departure gates, cancellations, and delays which comes in handy to the busy traveler. The app is available on iOS and Android devices. Don’t trust online travel agencies anymore? TripAdvisor offers honest reviews from fellow travelers of hotels, vacation rentals and restaurants. It also offers price comparison which is a great way to manage your expenses. The app is available on iOS and Android. Plan and book your flights with this leading global travel search site’s app. Its apps are free and have already won over more than 40 million users. The app is clean looking and even offers detailed info on price fluctuations. Google has recently launched a digital travel agent app called Destinations on Google. According to latest tech news, this new app lets users “search destinations, view suggested itineraries and price their flight and hotel.” Seems like a good addition to the classic Google maps app. Of course, when you’re getting ready for your big trip you want to know the weather conditions of the area you’re heading to. WeatherPro is pretty accurate in offering detailed weather reports. This is definitely a perfect tool for the outdoorsy type. Don’t know what to pack in your suitcase? Check out the weather in this app and you’ll be sure to not carry unnecessary attire. With more than 5million downloads, this accurate, up-to-date currency conversion app will help you keep a track of your spending. The app is clean-looking and easy to use, but most of all, reliable. It is available for Android and iOS users. The Time Out app is a great planner and travel guide that offers advice on the best places to wine and dine. You’ll get the latest info on local events and make sure to not miss out on anything on your travel weekends. Time Out is a growing app, offering in-depth info on a large number of cities each day. Oldie but Goldie, this app helps you have easier communication with locals overseas. It can also translate road signs using the scanning mode. With this handy app, you’ll be sure nothing is lost in translation. It can also come in handy at local restaurants that don’t have English menus, just scan the menu and you’ll be able to pick and choose local meals. Travel apps are handy tools that will probably take up the space of your phone on your holidays. The digital travel market is ever growing with a worldwide worth of $450 million in 2014. Almost half of all travelers are planning and organizing their trips on their phones and for good reasons also. Apps are a handy and convenient way that makes traveling easier with each new invention. Katleen is a content writer. She loves to publish her articles on various technical related websites. In her spare time, she likes to do research and writing articles to bring awareness. She is working as Communication Practitioner and Technocrat Expert Writer. Advocating all types of technical professionals. Connect with her on Google+, Pinterest, and Twitter. thanks admin for the trip guide. Welcome! I'll continue giving you more and latest update here... Hope you've enjoyed the information I provided! That's so good Aliona! Everyone must go for it using daily apps as these are advanced technologies that makes our work more easier!